Here are six fun activities using German Christmas words. 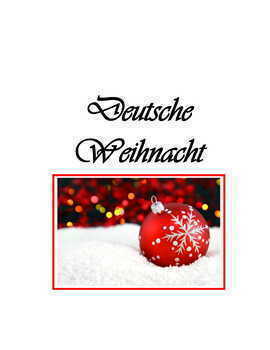 .. A partner activity to introduce German Christmas vocabulary ..
.. Fun matching activity using German Christmas carols ..
.. Activity unscrambling German Christmas words ..
.. Another activity using German Christmas vocabulary ..
should you prefer to buy a bundle. Looking for an overview of German Christmas customs ? 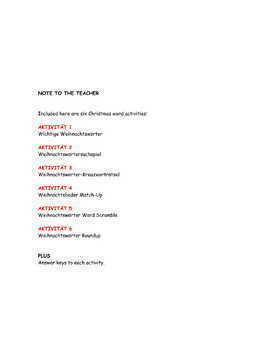 Want to explain Nikolaustag to your class ? 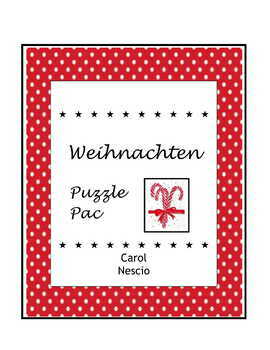 * Nikolaustag * Pac For GermanIf you like my products, please follow me by clicking on the little star at the top under my name. Danke. * Single Sub * Plan 11 For German.. Ooh La La ! ..
* The Use of du * ihr * Sie in German .. It's free. ..
* Tissue * Box Project For German Class .. A great back-to-school review project. ..
* A Light History Of The English Language For German Class* The Color * Game For German Class .. Vorsicht. This can get pretty exciting ! ..
* Menu * Project For German Class.. Great back-to-school activity for level 2. This makes a nice bulletin board or hall display of student work for Open House night. ..
* Wordle Activity * Pac For German .. Be prepared for Excitement with a capital E ! ..
* Wedding * Customs In Germany .. Fun to talk about right before Valentinstag. ..
* Let's Talk Business: In German .. Perfect, too, for after the AP Exam. ..
* German-American Day * Famous People .. For October 6th ~ German-American Day. ..
* German-American Day Activities * Pac .. For October 6th ~ Easy activities to make this day special. ..
* Famous German-Americans Crossword Puzzles* German * American Day Bundle* Teach German Day * Pac* Oktoberfest Word * Searches* Mamie Eisenhower * Think Pink .. It's free. ..
* German Halloween Activity * Pac* November 1st * Tombstone Project For German.. Nice for Allerheiligen. ..
* Valentinstag ♥ Carte For German Class* Einstein * Trivia Game ~ Year 1 .. For 3.14 - Pi Day and Einstein's Birthday. ..
* Einstein * Trivia Game ~ Year 2 .. For 3.14 - Pi Day and Einstein's Birthday. This was such a hit in German 1, my students made me make a German 2 version. ..
* Mother's Day Project * Pac For German.. Nice for Muttertag im Mai. ..
* Komm mit Level 2 ~ Video * Pac* Lotto * Pac For German .. Review more than just numbers with this fun way to reinforce vocabulary, too. ..
* Photo Scavenger * Hunt For German Class.. Perfect for after the AP German Exam or for upper level students. ..
* Battleship * Pac For German .. Good oral practice of verb tenses. ..
* ABC-Büchlein For German .. Need a recruiting tool ? Try this. ..
* Monster * Project For German Class* Country Map * Project For German Class.. Easy for German 1 and makes a nice bulletin board or hall display of student work. ..
* Fun End-Of-Year Awards For German Class .. Nice way to end the year. ..
* Word Wise Vocab * Pac For German .. Nice for expanding the vocabulary of your AP German students. ..
* Movie * Pac For German ~ Set 1* Movie * Pac For German ~ Set 2* Movie * Pac For German ~ Set 3* Movie * Pac For German ~ Set 4 ~ Biographies* Feature * Film ~ Nordwand (North Face) .. You'll be on the edge of your seat till the very end ! ..
* Feature * Film ~ Race.. The 1936 Berlin Olympics. Nicely done bio-pic for Black History Month. ..
* Feature * Film ~ Jesse Owens - American Experience.. An interesting documentary. Perfect link between German and Black History Month. ..
* Feature * Film ~ Bella Martha Mostly Martha .. Sweet film. Fits in nicely with a food unit. ..
* Feature * Film ~ Rosenstraße Rosenstrasse.. The only successful resistance attempt under The Third Reich. ..
* Rick Steves * Germany Benelux & More* Feature * Film ~ Marx & Coca Cola .. A delightful film about post-Reunification hurdles. ..
* Feature * Film ~ Vitus .. Good way to touch upon German-speaking Switzerland. ..
* Feature * Film ~ Das Wunder von Bern* Feature * Film ~ Die weiße Rose ~ The White Rose* Feature * Film ~ Einstein's Wife* Feature * Film ~ Influenza 1918* Feature * Film ~ Lola rennt ~ Run, Lola, Run* Feature * Film ~ Night Crossing .. Da sitzen Sie auf heißen Kohlen bis zum Ende ! ..
* Valentine's Day ♥ Trivia Game For French, German, Italian, Spanish.. Perfect fun activity in February for your German Club. ..